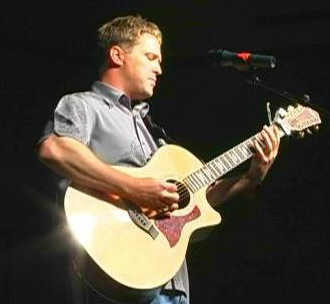 James Goforth, an ordained minister of the Gospel, is a passionate songwriter, incredible guitarist, and worship leader. strong guitar-driven rock with a dab of blues. Music has taken James all over the world--from Mission trips to Romania, to touring with The Continentals to leading praise and worship and presenting concerts all over the state of Texas. His ministry has taken him to New York City, Nashville, Arkansas and the Carolinas. James established Cross Strings Ministry in 2000. He is married to Susan and they have one daughter, Selah Grace, born in December, 2006. Presently, they make their home in DeSoto, Texas. James' personal testimony relates how he became a Christian at the early age of 5 and was baptized when he was 8 years old. He grew up in a Christian home where music played an important role in his upbringing. Both parents are musicians as well as his sister who is an accomplished pianist. Sports were an important part of his early life and he played baseball and football (varsity starting quarterback his junior and senior years.) However, music played a big role. Studying piano during his early years, playing coronet, baritone and bass in junior high and singing in the award winning high school choir laid a good musical foundation. From age thirteen, he devoted many hours to playing his guitar. The latest addition to James' ministry is a band, GOFORTH!. The band is comprised of James on Lead vocals, electric/acoustic guitar, Michael Peterson on percussions. He has been a blessing to all who have heard and seen him live, and to those who have listened to his anointed music, either on the radio, CD, tape or video. James specializes in working with, organizing and critiquing Praise Teams/Bands. In churches that have praise teams and bands, he works to prepare them to lead in his pre-concert praise and worship time. He is available to churches desiring to begin contemporary praise and worship services or to assist those who already have a praise team/band. James also gives private guitar lessons in his studio, Living Waters.